Greg Irwing: "Study of the effects of forest fragmentation on avian biodiversity in Chiew Larn Reservoir". Wyatt Petersen: "Core versus edge: the status of clouded leopard Neofelis nebulosa in Khlong Saeng Wildlife Sanctuary". Tiwa Ong-in: "Distribution, Conservation Status and the Effect of Human Disturbance on Galliformes in the Lowland Forest of Southern Thailand". Greg Irwing: “A hydroelectric dam in Peninsular Thailand has devastated the surrounding resident forest bird community”. Inês Silva: “Are bats vulnerable to roads in Southeast Asia? A case study of wildlife–vehicle collision mortalities in a biodiversity hotspot in Thailand”. Katie Oliver: “The short lived haven of plantation forests for N. bengalensis”. Rungrong Angkaew: “A test of road edge effects on the nest survival and the post-fledging survival of a tropical forest passerine”. Tiwa Ong-in: “Status and distribution of forest partridge in the Thai Peninsula: a worrying situation”. Worata Klinsawat: “MtDNA and MHC diversity of captive tiger (Panthera tigris) in Thailand: A case study for captive breeding improvement”. Wyatt Petersen: “Fragmented forests: overlooked avenues for tropical small carnivore conservation?”. 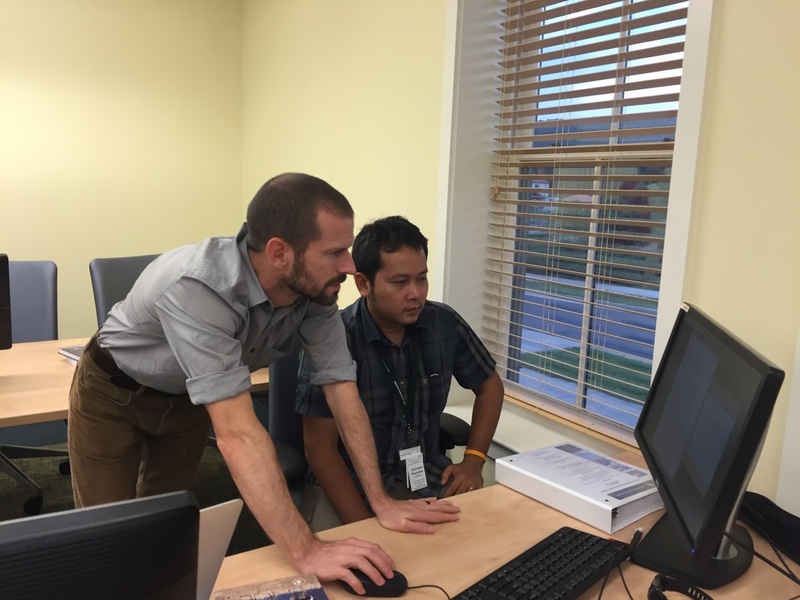 The workshop was held as part of the Wonders of the Mekong project sponsored by the United States Agency for International Development (USAID), and is hosted by the Inland Fisheries Research and Development Institute, the University of Nevada – Reno, and FISHBIO. CEG researcher Naruemon Tantipisanuh gave an oral presentation on “Tools and technique for studying rare otter species: case study from west coast of southern Thailand”. The workshop, facilitated by the Biodiversity Conservation Society of Sarawak (BCSS), introduced the concepts underlying Bayesian approaches to data analysis, running standard analyses with the wiqid package in R. The modelling language used by the JAGS package makes it easy to write code for quite complex models, as the code closely follows the mathematical expressions we use to define the model. JAGS does not have a stand-alone GUI, but is closely integrated with R statistical software. The workshop was attended by 22 participants including 2 from the Xishuangbanna Tropical Botanical Garden and Naresuan University; 1 from Mahidol University, Chiang Mai University, National University of Singapore, Wildteam Bangladesh, Suranaree University of Technology and Newcastkle University and 12 from the Conservation Ecology Group (KMUTT). The Workshop was coordinated by Mike Meredith (BCSS and WCS), with the assistance of Ngumbang Juat (BCSS staff), Lukmann Haqeem bin Alen (WWF Malaysia) and Dusit Ngoprasert (CEG-KMUTT). Naruemon Tantipisanuh: “Status and distribution of two otter species in coastal areas of southern Thailand". Worata Klinsawat: “Phylogeography, demographic history and genetic connectivity of Asian elephants (Elephas maximus) in the Tenasserim Range, Thailand". 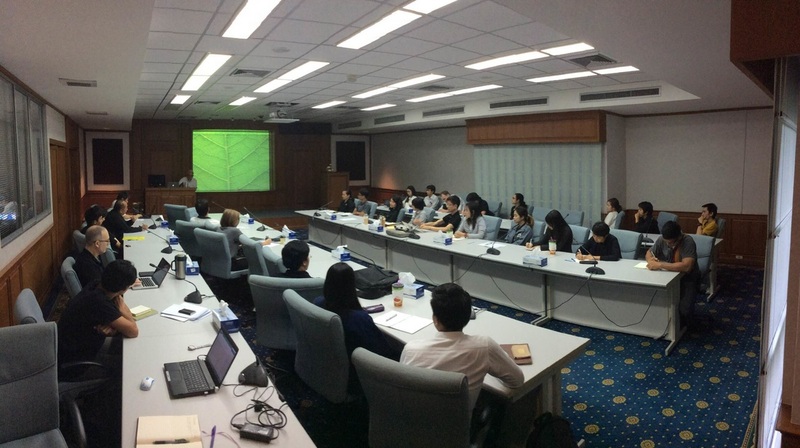 Five CEG-KMUTT presentations were delivered during the meeting. George A. Gale: “The launch of the Thai Chapter of the Society for Conservation Biology: Why might joining this organization benefit Thailand’s biodiversity” (plenary talk). Andrew J. Pierce: “Investigating the migration ecology of two Asian sparrow hawks along the East Asian Continental Flyway” (invited session). Worata Klinsawat: “Phylogeography, demographic history and genetic connectivity of Asian elephants in the Tenasserim Range, Thailand”. Daphawan Khamcha: “Road induced edge effects on a bird community in a dry evergreen forest”. Kitipat Phosri: “Status and distribution of two Otter species in Andaman Mangrove Forest in Southern Thailand”. The training, co-organized by Newcastke University (UK) and by the CEG-KMUTT, was attended this year by 13 undergraduate students. The training was carried out at Sakaerat Biosphere Reserve where the students were introduced to the research undertaken by the Conservation Ecology Programme and how it fit in the overall conservation situation in SEAasia. The students then followed by a set of lectures on wildlife monitoring techniques for three days before starting their final group projects (proposal defense, data collection and analysis, results presentation). Three PhD students from the CEG-KMUTT attended the conference to present the research, sponsored by the Royal Golden Jubilee grant, in the Multi-disciplinary Exercises session. Daphawan Khamcha: “Nest survival and nest predation in dry evergreen forest, Northeast Thailand”. Somying Thunhikorn: “Assessing the population of grey peacock-pheasant (Polyplectron bicalcaratum) in a Southeast Asian conservation”. Niti Sukumal: “Ecology and landscape conservation of Green Peafowl (Pavo muticus)”. Moreover, all three students received an award for best research project and Daphawan also received an award for best oral presentation. Congratulations to Vy Trai Nguyen for successfully defending his PhD! George A. Gale: “Using a quantified approach to perform successful conservation” (invited speacker). Ines Silva: “Wildlife-vehicle collision mortality in a Thai biodiversity hotspot: implications for conservation”. Pichani Saengtharatip: "Patterns of stream anuran species richness and abundance across an elevational gradient in Huai Kha Khaeng Wildlife Sanctuary, Thailand". Ines Silva: “Spatial patterns of snake mortalities along a highway in a biodiversity hotspot in Northeastern Thailand” (poster). Congratulations to Chanthasone Phommachanh for successfully defending his MSc! Somying Tunhikorn: “A current conservation status of Gray Peacock Pheasants in Thailand”. Nay Myo Shwe: "An attempt to conservation for Vultures in Myanmar". Congratulations to Somying Thunhikorn and Niti Sukumal for successfully defending their PhD! 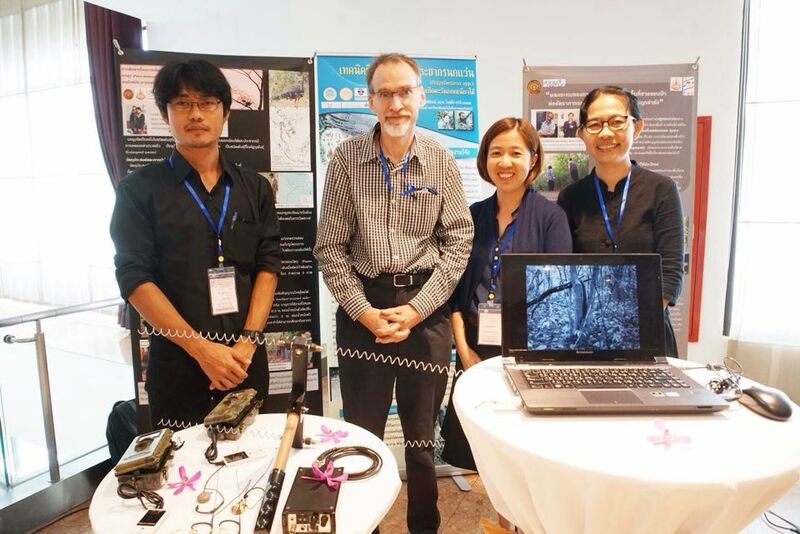 PhD candidate Somying Thunhikorn and MSc candidate Greg Irving were invited to present under the theme Khao Sok - Khlong Saeng Forest Complex after construction of the Rajjaprapha Dam." Somying presented on on habitat loss and how it affected threatened wildlife, including complete loss of Tiger (Panthera tigris), Dhole (Cuon alpinus), Banteng (Bos javanicus), Hairy-nosed Otter (Lutra sumatrana), and Fishing Cat (Prionailurus viverrinus). She also touched upon her MSc research that assessed the dam's impact on Malayan Tapir (Tapirus indicus). Greg presented observations from his study of avian community diversity in Chiew Larn Reservoir, highlighting the lack of resident Sundaic forest species at the heart of what was once southern Thailand's largest contiguous lowland forest. Some threatened species that were present before dam construction are now lost from the forest complex or extirpated from Thailand, including Straw-headed Bulbul (Pycnonotus zeylanicus) and Rail Babbler (Eupetes macrocerus). PhD candidate Niti Sukumal presented his PhD results on “Landscape-scale conservation of Green Peafowl in Southeast Asia” at the Chester Zoo seminar. Niti is currently in the United Kingdom as a guest student for a three-month study visit funded by the Newton Fund. 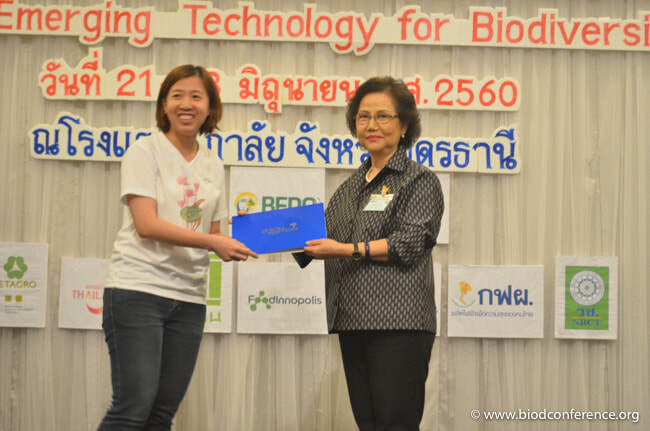 With WWF Thailand financial support, PhD student Worrapan Phumanee participated in a two weeks course led by a diverse team of expert instructors (i.e. Distance sampling taught by Joe Kolowski, Mark-recapture analysis taught by Gary White, and occupancy modeling taught by Jim Hines and Jim Nichols). Congratulations to Wanlop Chutipong for successfully defnding his PhD! 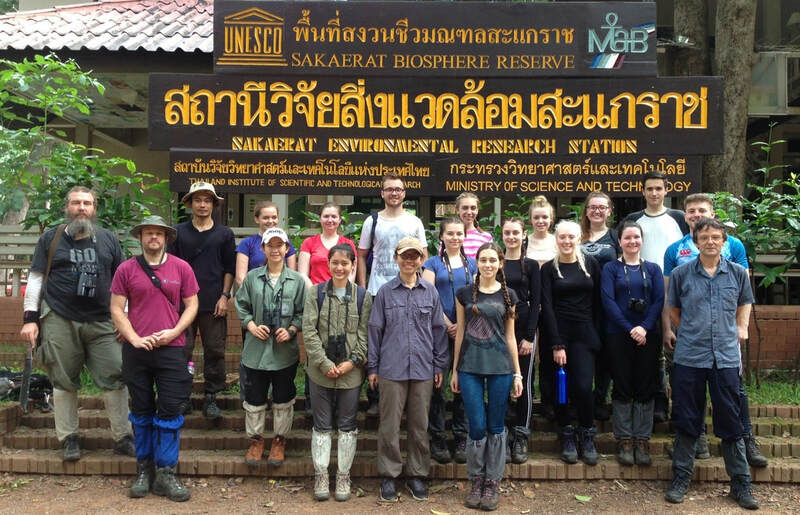 Next steps for Wanlop are part-time faculty position with the Conservation Ecology Program lab while making plans to explore new research opportunities in Thailand and Indonesia. Special course: "Introduction to GIS with QGIS and R"
"Geographic information system (GIS) tools are essential today for understanding what is happening around us. A commonly used application is QGIS, which is free, open-source, cross-platform software that is constantly updated for greater performance. QGIS works on Macs and Linux, but the facilitators only have experience with Windows. This workshop is intended for those who want to learn the basics of GIS but do not have access to proprietary software." Thanks a lot to our friends at BCSS for facilitating another exceedingly useful training!! Special course: "Charts and Graphs in R"
"Some types of charts can be drawn in spreadsheet software (eg. MS Excel or LibreOffice Calc), but R offers both a greater range of chart types and more flexibility in adjusting chart details to meet the demands of journal editors. We will focus on the powerful base graphics package in R, and only refer briefly to other add-in packages and ImageMagick." Thanks a lot to our friends at BCSS for facilitating!! It was great to see the practical comparative benefits of QGIS and R vis-a-vis ArcGIS and other applications. Special course: "Bayesian Networks for Decision-making"
"The workshop offered an introduction to the concepts of Bayesian Networks (what are they? why do we use them? who uses them? ), followed by an exercise sing GeNIe software to build a network and interrogate it." Matt has a put together a nice write-up on his lab's site. Pornpimon Tangtorwongsakul: "Influence of cropping systems and orchard management on bee communities in an anthropogenic landscape". Anucha Kamjing: "Landscape effects on smooth-coated otter (Lutrogale perspicillata) occupancy in the Inner Gulf of Thailand". Naruemon Tantipisanuh: "Incidental impact from major road construction on one of Asia's most important wetlands, the inner Gulf of Thailand". Inês Silva: "The importance of a multi-taxa approach to road ecology: a case study in northeast Thailand". Greg Irving: "Avian species diversity in areas affected by the Rajjaprabha Hydroelectric Project, Suratthani Province, Thailand". 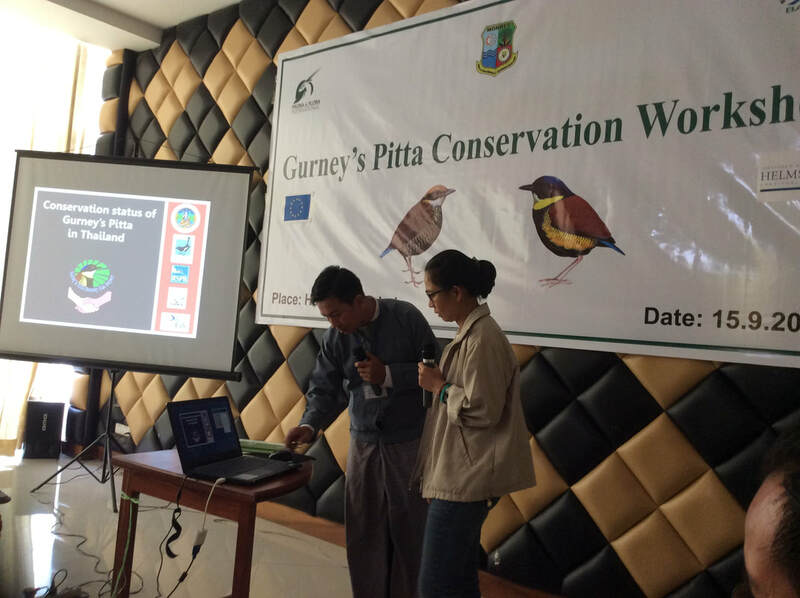 Chenzing Yu: "Roost habitat selection and activity pattern of Spotted Greenshank (Tringa guttifer) in Thailand" (presented by George A. Gale). Myo Shwe: "Myanmar oil palm plantations: A productivity and sustainability review". During the “Primates on the move: from local to landscape scale” session at the annual meeting of the Association for Tropical Biology and Conservation, Tommaso Savini presented the work of his MSc Student Suchada Phiphatsuwannachai “Forest types affect seed shadows by white-handed gibbons” while Marie-Claude Huynen, Liege University (Belgium), presented, as coauthor, the work of Postdoctoral Researcher Juan Manuel José-Domínguez on “Space use and directness to out-of-sight resources in semi-provisioned and wild-feeding groups of Macaca leonine”.